Not a dumb question at all, actually a great question. There's actually a bit more to my analysis than I post on the blog which might or might not be obvious in the posts. My goal per post is to give a good outline from which an investor can jump start their own research. At least that's my hope, I have no idea if anyone is actually doing further research or buying any of these stocks. I agree that cash generation is much more important than earnings power and this is something I do take quite a good look at. I like to work in the order I describe in the Dainichi post. I check to make sure the balance sheet is decent, then earnings, and use cash flow to verify that earnings are real or good. I have some cash flow worksheets I go through, including building out a direct cash flow statement so I can see how cash is generated or utilized. 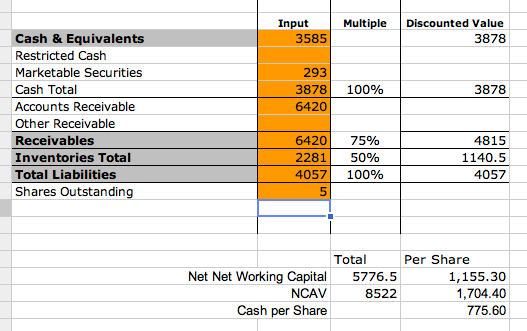 I also use operating earnings a lot which is a very poor man's cash flow, this is seen in the EV/EBIT calculations. The reason I look at earnings and discuss them verses only focusing on cash flow is because that's what the market looks at. In addition for a company that has high quality earnings cash and earnings should line up pretty closely over time. In the case of SPK they do have decent FCF as defined by CFO-capex and they use a lot of it to pay out a dividend. 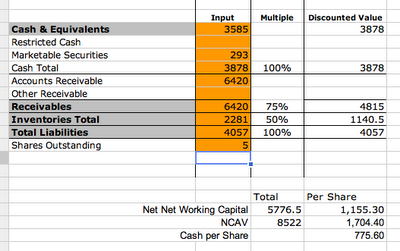 There is minimal capex and most of the cash flow is paid out in dividends or added back to the cash balance. One last note is I'm a bit dubious of FCF meaning CFO - capex or maint capex. 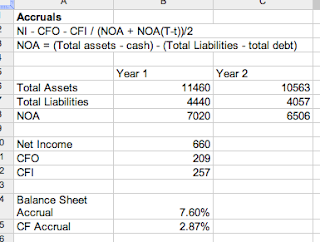 I think accurate FCF is actually working up a normalized CFO for average working capital items and removing corporate fat. In the case of examining a net-net I want to ensure it's cheap, and make sure the operating business isn't destroying the balance sheet value. Very interesting Nate! My wife is Japanese...is there any info written in Japanese that you would like to have the translation? I am also interested in this stock. You are in luck when looking at cheap Japanese stocks. I am able to get along fine reading the statements with a translator, what I have trouble finding is news items about the companies. Most news stories are in the local language and I don't speak Japanese. If you have any luck finding anything local about some of these companies it would be helpful. Thanks for the offer. I added two links to the bottom of this post, the company website and their English filings. I can't believe I forgot to do that originally. This might not be very helpful but my wife looked on the web for some news but actually hard to find. She uses finance.yahoo.jp -- but for each Japanese stock there is like a blog/forum where many comments on the stock and yes many came to the same conclusion as you: it is a very interesting net-net. But I wish we could get additional info....aww those Japanese - so mysterious!